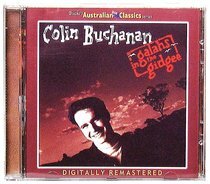 Colin Buchanan's success recording children's albums has sometimes overshadowed his career as a gifted country music artist. Recently, LAND OF THE GETAWAY has broken this trend. GALAHS IN THE GIDGEE, HARD TIMES, and THE MEASURE OF A MAN are earlier works, re-mastered to introduce us to Colin's beautiful songs about the landscape and the people Australia. About "Galahs in the Gidgee"